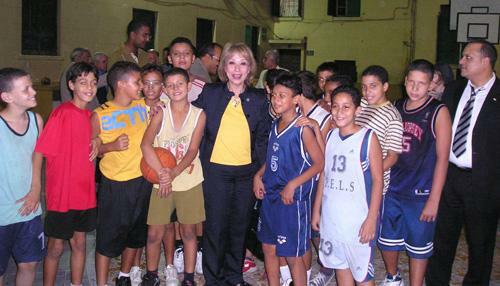 September 20-23, 2005 - Numerous government officials, dignitaries and diplomats attended the 2005 UFMEP United Nations International Peace Day Conference in Cairo, Egypt. Among those participating in the conference were Mrs. Sally Kader, UFMEP President, Mr. Ralph Kader, UN Diplomat, Dr. Mamdouh El-Beltagui, Minister of Youth, Dr. Moufid Shihab, Egyptian Minister of Legal Affairs, and Dr. Ahmed Darwish, Egyptian Minister of Economic Development. Numerous religious leaders participated including those from the El Azher Mosque, the local Catholic Church, a Vatican Envoy and the Coptic Christian Church among other denominations. Various significant government officials, heads of Universities, leading area scholars and notable Egyptian actors and actresses also took part in the event. Master Mahmoud Badry, General President of the Muslim Youth Association, and Counselor Ahmed El Fadaly – representing UFMEP and the Muslim Youth Association – were engaged in the conference as well. The conference additionally included a meeting with the Mayor of Sinai as well as tours of Cairo. President Kader further gave a motivational speech in which she urged the audience to join hands and make a vow in working towards peace in the region. Mrs. Kader’s challenge is historically significant due to the high level of dignitaries affirming her call for peace. Footage of this monumental peace vow was also aired repeatedly on all major Middle Eastern television stations.